Obituary – Moore, Virginia Lee (Oberholzer) « Perry High School Alumni Association, Inc.
Funeral will be at 2 p.m. Tuesday at Parker Funeral chapel for Mrs. Lloyd (Virginia Lee) Moore, 22, 701 Jackson Street, who died early Saturday in a two-vehicle accident at the west edge of Stillwater. Rev. M. R. Work, pastor of the First Christian church of Perry, will officiate. Burial will be at Grace Hill cemetery. Active casket bearers will be Ernest Dean Moore, Gary Moore, Don Boyd, Don Hawthorn, Jake St.Clair and Bill Wilda. Honorary bearers will be Jimmy Ewy, Jerry Lowry, Gary Stephens, Garry Wilson, Dan Hasenfratz, Jimmy Hoggatt, Larry Montgomery and Doyle Balzer. Mrs. Moore’s husband, Lloyd, was critically injured in the collision. He was transferred early Saturday from Stillwater Municipal hospital to University hospital at Oklahoma City of treatment of head, internal and other multiple injuries. Moore was listed as improving and was expected to be moved to a patient room from intensive care Monday. Mrs. Roy F. (Ira Leona) Ireland, Blackwell, also was killed in the accident Funeral arrangements for Mrs. Ireland are under direction of Hamilton-Porter Funeral home at Blackwell. Mrs. Ireland’s husband was admitted at Stillwater Municipal hospital for treatment of back, ankle and facial injuries. Another passenger in the Moore vehicle, James Hotson, 18, 1305 ½ Cedar street, was admitted to Stillwater Municipal for treatment of head injuries. Mrs. Moore, the former Virginia Oberholzer, was born July 23, 1946, at Enid. She had lived in Noble county most of her life and was a 1966 graduate of Perry High School. She and Lloyd A. Moore were married Nov. 14, 1974. She was a member of the Methodist church. 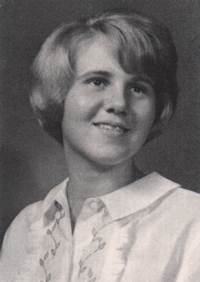 In addition to her husband, of the home, survivors include three daughters, Tammy, Tracy Renee, and Christine, all of the home, one son Darrell Wayne, of the home; her mother, Mrs. Edith Whitchurch, Perry, one brother, Robert Oberholzer, Perry; one sister, Mrs. Larry (Wanda) Riley, Perry, and her maternal grandmother, Mrs. Marie Utsler, Perry. She was preceded in death by her father, Henry Oberholzer.